The Milky Way is a galaxy, a slowly rotating cluster of more than 200 billion stars! 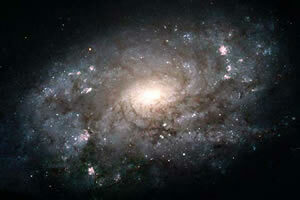 It is one of many galaxies in our universe. Our Milky Way galaxy looks a little like a pinwheel. It is a spiral galaxy, about 100,000 light years across, with a bulge in the center (called the nuclear bulge) that contains the nucleus, a wide, flat disk with distinct spiral arms, and a surrounding halo of stars. There are several “spiral arms” in our Milky Way: Sagittarius, Cygnus, Perseus, and Orion. Our solar system is located at the inner edge of the Orion arm. Our galaxy slowly spins and our solar system spins with it. Our solar system takes about 250 million years to make one complete orbit around the center of the galaxy. This deep, near-infrared image shows the innermost three light years of our 100,000 light-year-wide galaxy. 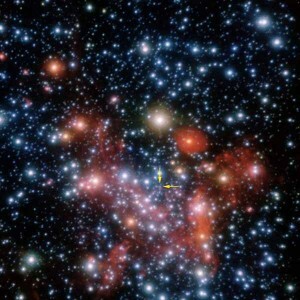 The star indicated by the yellow arrows is moving under the influence of an unseen, enormously compact object with the gravity of four million Suns—and that the center of our galaxy is 27,000 light years away from where we are. The only thing so small that can exert such tremendous force is a Singularity. It is now thought that all galaxies are characterised by a Singularity at their centre. Whatever is at the galactic center, it is of immense power. The force exerted by our Sun in holding the planets and countless asteroids and other cosmic objects in their orbits, is massive yet the Central Sun at the galactic center, has the power to hold more than one hundred billion Suns. Modern astronomy interprets the power of the Singularity as evidence of the imaginative theoretical construct called a “Black Hole”. The idea comes out of the over emphasis of the force of gravity as a consequence of matter in current cosmic theory. The Singularity is far from black and is not a “hole” in space but a “Whole” in space. Every part of the Absolute Singularity of the Universe, contains this “Radiant Whole” as infinite nested fractal sets, repeating at all levels. There is only One Singularity and all apparent separate divisions, have at their heart, the same One singularity. Distance and separation, are artifacts of the dimension of viewpoint. Our Sun is but one of a collection of about 200 billion stars known as the Milky Way, around which it revolves once every ¼ billion years or so, taking its retinue of planets with it. The galactic center around which it revolves is the highest vibration human beings can receive and perhaps process here on Earth. This is possibly because one of its children, our Sun, acts as a step-down transformer and mediator of the galactic center’s energy to the denizens of one of its grandchildren, the planet Earth. This is behind the love you’re receiving.